We Americans work a lot. A 2005 study by the Families and Work Institute found that two-thirds of Americans are either "highly" or "chronically" overworked, and it shows in our faces and sighs. All American workers face the basic conflict between material comfort and leisure time. Why can't we have a lot of both? The immediate answer is our market-driven economy, which ensures that punishment for slacking off is swift and dire. The deeper answer is the interaction of two inconveniences fundamental to humanity: hedonism and narcissism. The mainstream American life is filled with work. We are overscheduled in childhood and overworked in school in pursuit of a spot at a demanding university. There, we work even harder for a desirable niche in the economy, for which we ultimately toil more than a third of our waking hours. In "Overworked American: The Unexpected Decline of Leisure," Juliet Schor shows that in the late 1940s, a 100-year trend of increasing leisure was abruptly and drastically reversed in the United States, but accelerated in Europe. Many Americans only slightly consider workload in deciding which jobs are desirable. 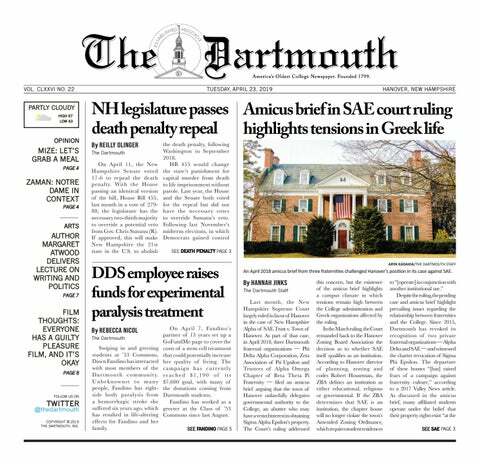 Dartmouth students flock to the financial sector, in which many will work upwards of 80 hours per week. The draw is almost purely financial -- that is, hedonistic. Eighty hours of weekly drudgery is justified by the material comforts that result. But just how much happiness will those comforts bring you? According to the emergent field of happiness economics, that depends in large part on how comfortable your neighbors are. All else being equal, we like to be at least as comfortable as those around us, and are much less satisfied if we are not. So long as the wealth disparity is not overly huge, we prefer to be richest -- we are narcissistic. As we experience increasingly comfortable lifestyles, we require more comfort to maintain the same level of happiness. Social psychologists call this the "hedonic treadmill." Together, hedonism and narcissism lock us in a perverse state. To use a term from game theory, the American economy is a giant "prisoner's dilemma." Everyone would be happier if everyone worked less, but each individual wants to work a lot to compare favorably in material status with everyone else. We are stuck in the rut of perpetual overwork despite the fact that everyone would prefer to cooperate to work less. Pause for a thought experiment. Imagine that all Americans stopped working, except farmers. Now put the food truckers and supermarket clerks back to work. Now the gas station attendants, because you need to drive to the supermarket. Now the auto mechanics, plumbers and electricians, who are necessary for repairs on occasion. Continue this process until everyone is working whose work is involved in the maintenance of society's current state of material existence; let rest all those whose work is related to competitive innovation and future change. In this process, I estimate that you would put to work no more than about half of our current workforce. This is a choice society could make, in theory at least. If we chose to content ourselves with our current state of material wealth forevermore, we could probably halve our required person-hours of work. Distributing the cuts evenly, this would amount to about 20 hours weekly of extra leisure for everybody. This system would require the abandonment of competitive innovation as an economic virtue, but not as a private one. If it would make everyone happier, the change would be worth it. But of course, my innovation-free economy is impossible. Within a market-based structure, the system would require an unrealistic enforcer to keep everyone working only 20 hours per week. Otherwise, some individuals would work extra to get ahead personally at the expense of everyone else; in time, everyone would be working extra just to keep up, and we would be back to our current state of overwork. An obviously unacceptable alternative is a state-run economy that would assign jobs to individuals. This structure would encounter the opposite enforcement issue -- nobody would work. The only solutions to the problem of overwork are cultural. They all amount to changing the underlying payoff structure of the "game" American workers play--reining in our hedonism and narcissism. Hedonism is a bit less acceptable in France; narcissism is a bit less acceptable in Sweden. Buddhism attempts to eliminate hedonism altogether. But short of nirvana, we are bound by our own deplorable nature. We can only go round and round on the treadmill of hedonism; this is our dilemma as prisoners of humanity.